The glass stage Arbuckle used in His Wedding Night. At right, the end of the stage behind Roscoe in Oh Doctor! Noted biographer James Curtis contacted me with an intriguing observation. Did a scene from the 1917 Arbuckle-Keaton short Oh Doctor! (above) reveal the large glass rooftop shooting stage of the former Biograph Studio, located at 807 E 175th St in the Bronx? A little digging not only confirmed he was right, but that 100 years later many Bronx locations from that film remain recognizable today. [Note: Arbuckle ended his career filming Vitaphone comedy shorts in Brooklyn – discussed in great detail HERE]. Click to enlarge – a 1921 Biograph map, keyed to 11 locations – NYPL. The top row of buildings, the north side of E 176th St, were all lost to the Cross Bronx Expressway, which devastated the neighborhood. Wearing a borrowed police uniform, Roscoe chases jewel thief Al St. John across a vintage rooftop. Triangulating from the Biograph site, and traveling the streets using Google Street View, I was excited to see that two apartment buildings on Marmion Street are still standing today. View (11) – Roscoe scales the roof, with Crotona Park and 1783 Marmion at back. 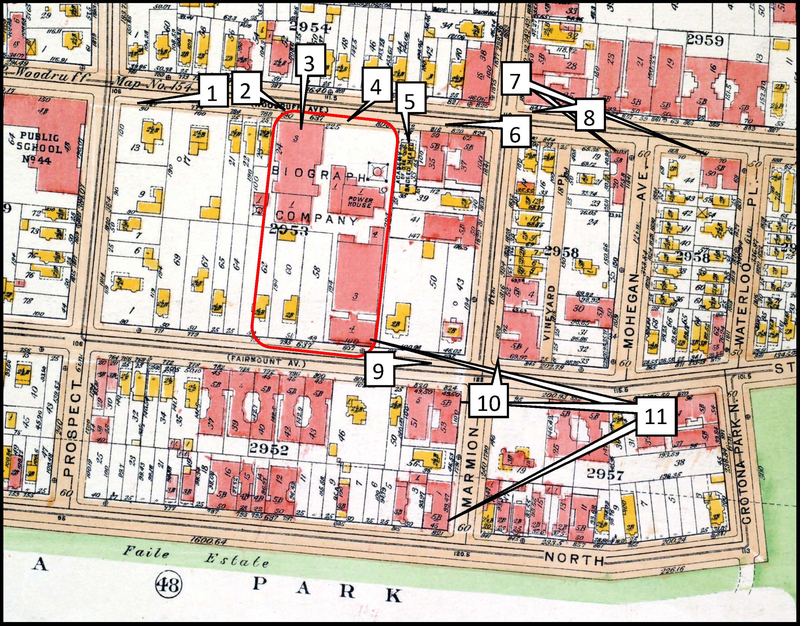 Because Roscoe’s roof (11) had an unobstructed view, and the maps from 1915, 1921, 1938, and 2017 reveal when different buildings were constructed, and demolished, my best guess is Roscoe filmed (11) on the former 5 story apartment at 864 E 175th, now replaced with a smaller building. View (11) – looking along E 175th St towards the corner of 1801 Marmion (left) and the Biograph office and glass stage (right). Once I had confirmed site (11), I contacted New York pop culture locations expert Bob Egan (PopSpotNYC.com), who had just identified Buster Keaton’s Manhattan apartment from The Cameraman in this prior post. Bob replied with a fascinating clue – that the opening credits to the early 60’s sitcom Car 54 Where Are You? reveal a view of the Biograph Studio where the show was filmed (see below). 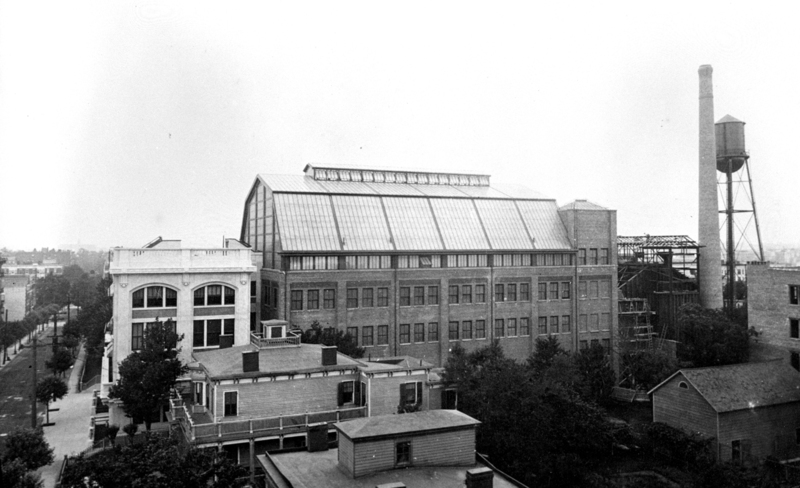 View (11) – the south Biograph office on E 175th (left) and view (6) – the north Biograph laboratory building on E 176th (right). The Car 54 view (6) down E 176th St provided a view of the segmented light and dark brick wall standing east of the Biograph laboratory building, a wall that appears frequently in Oh Doctor! View (6) and view (4) – the segmented wall next to the laboratory building. The two apartments behind the word “CAR” are now demolished – a vacant lot. I should have done this first, but after searching the New York Public Library online digital collection I found an exact match to view (4) from Oh Doctor! View (4) – the segmented wall standing east of the laboratory building. NYPL. It turns out that Oh Doctor! 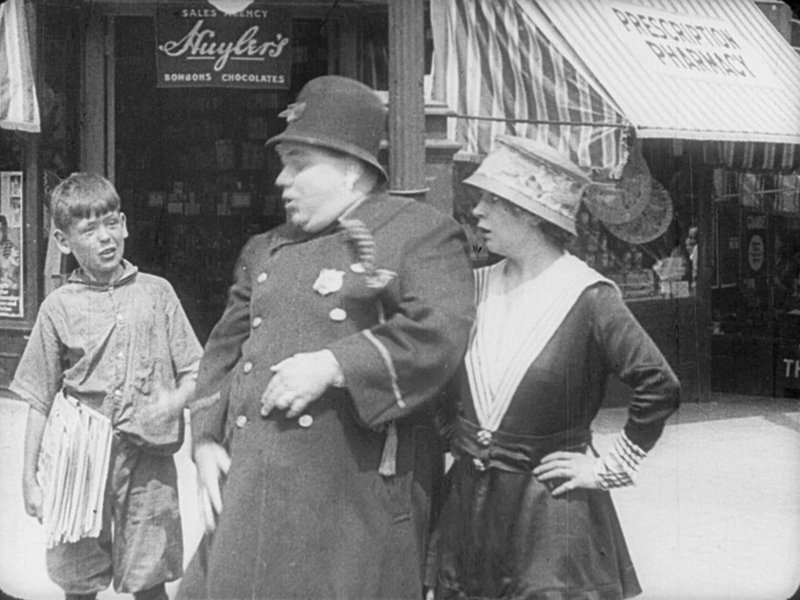 and the subsequent Arbuckle – Keaton short Coney Island (1917 – see further below) both feature scenes filmed on E 176th in front of the Biograph laboratory building. View (5) – Roscoe calls for his car to return to him – the existing home on 812 E 176th still appears at back. One challenge to investigating this site is that the northern side of E 176th St was demolished to make way for the Cross Bronx Expressway. One casualty is this drug store (left) that once stood at the NW corner of E 176th and Marmion. The same store appears at back in view (8) (right), as Roscoe drags Buster (dressed in drag to do a stunt fall for Roscoe’s wife) west along E 176th towards Marmion – the building to their right was lost to the expressway. In the next scene view (7) below, Roscoe’s wife confronts him standing at the same corner, only looking east down E 176th along the surviving south side of the street. View (7) looking east from Marmion down the surviving south side of E 176th, towards tall buildings on the corners of Mohegan and Waterloo Streets. View (7) above looks east down E 176th from Marmion towards the extant Waterloo Apartments, both left of Roscoe, and the narrower apartment on the corner of Mohegan just to the right of Roscoe. Views (9) and (10) – two images of the NE corner of Marmion and E 175th. I believe views (9) and (10) above and below both depict the same corner apartment building that once stood at the NE corner of Marmion and E 175th. As shown below, two homes once stood next to the Biograph office across the street from the apartment. View (9) left and view (10) right – these homes on E 175th once stood due east of the Biograph office. Buster stands at the corner of Marmion looking down E 175th. Al at back is standing on Marmion between the two wings of the apartment. While I have no direct photographic confirmation for (9) and (10) above, this is the only corner in the vicinity of the studio that had homes on the left side of the street and a large apartment on the right. The two scenes match the various maps and street slopes, and I’m confident this is correct. As further proof, the home adjacent to the studio office, seen below in 1913, has a similar low alternating fence design, and apparent gas lamp, as depicted in view (9). 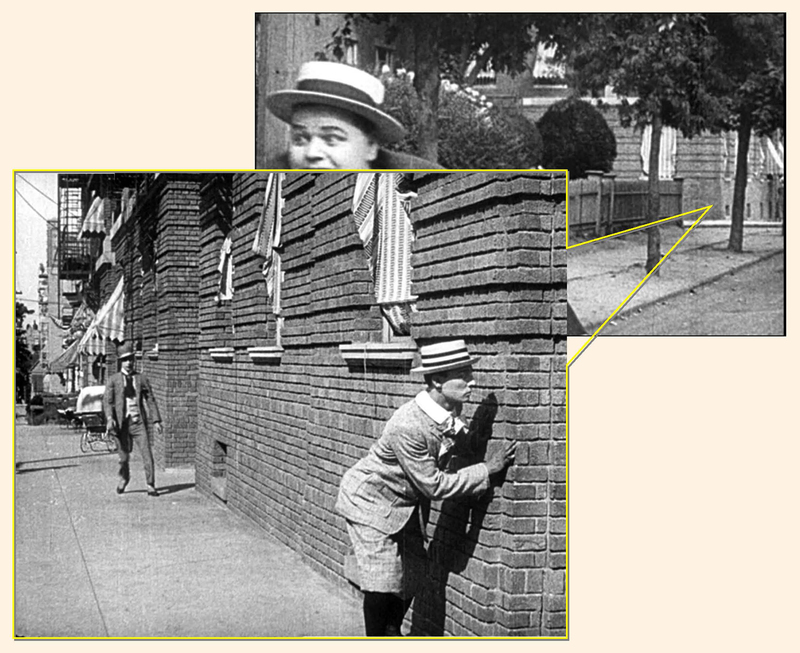 Click to enlarge – the home adjacent to the Biograph office in 1913, and matching fence in Oh Doctor! – Lantern Media. The home adjacent to the studio was replaced with a large apartment by 1921, but is now a vacant lot. The corner home (#825, see map above) is replaced by a large apartment still standing, while Buster’s 5 story corner apartment is now replaced with 2 story homes. Go figure. Coney Island – view (2) – Al escorts his new female companion from the Biograph laboratory entrance. The home at 812 E 176th still stands at back. In a racially insensitive final “joke” that was commonly employed by comedians at the time, Roscoe too notices the back of a woman pass by, and approaches her to say hello. But when she turns to greet him, revealing herself to be African-American, Roscoe gasps and flees in shock as the movie fades to a close. Apparently this scene was excised from most prints of the film, but for historical completeness is presented as a supplement to the latest home video release of these films. Coney Island – view 1 – Roscoe flees west towards the PS No. 44 building still standing on the SW corner of Prospect and E 176th. Oh Doctor! begins with Father Roscoe, Mother, and Son Buster arriving at a race track, where Roscoe flirts with another woman, and loses all of his money on a wild bet. The characters are depicted as arriving and departing from the race track by parking their cars in a residential neighborhood beside a rare conspicuous street sign at the NW corner of W 246th and Fieldston in the Bronx, see below. Oh Doctor! – at W 246th St and Fieldston. New York pop culture locations expert Bob Egan (PopSpotNYC.com) came through again, by identifying the real track appearing in the film as the Yonkers Raceway. Son Buster laughs at Pop Roscoe for losing all of his money on a horse that ran the wrong way, as they stand beside the Yonkers Raceway clubhouse. The Yonkers Raceway in 1905 at left, including the side of the clubhouse at left where Roscoe and Buster filmed (see above), and how it appears in Oh Doctor! This may be the oldest existing movie footage of the still active Empire City harness raceway, located about 10 miles north of the studio. I’ve documented 4 dozen instances of Keaton filming pickup shots from his various films in front of, or across the street from, his small studio in Hollywood. A perfectly practical thing to do. 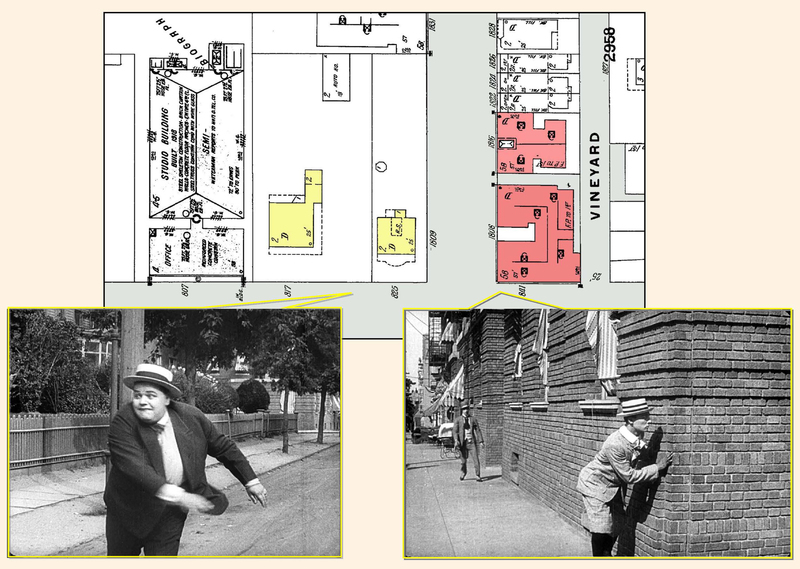 So it’s not surprising, but also fun to see, that Arbuckle did the same thing, staging so many shots conveniently close to his temporary Biograph home. Be sure to read about Arbuckle’s numerous Vitaphone Brooklyn locations HERE. 1917 and 1961 – matching views from Oh Doctor! and Car 54 Where Are You? It wasn’t too long ago that Oh Doctor! was considered a lost film! We fans are all so fortunate that these films have been so lovingly restored by Lobster Films. Oh Doctor! 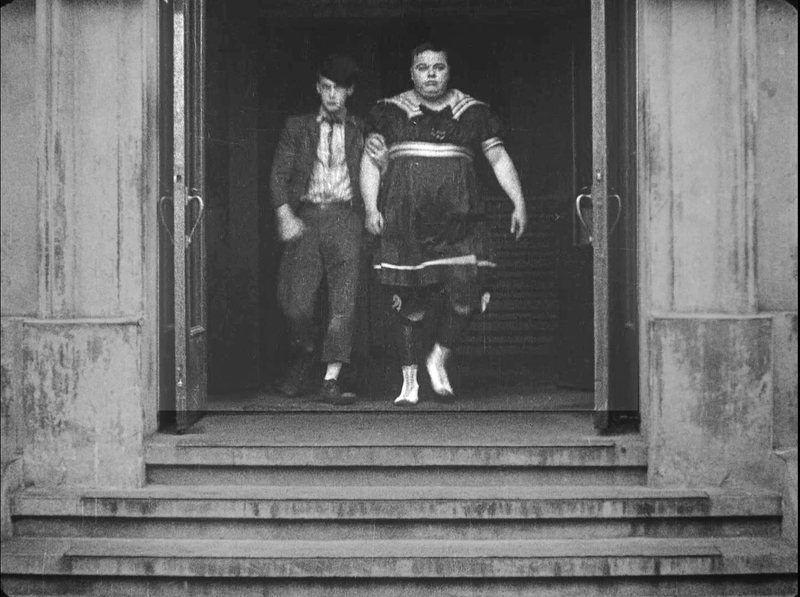 and Coney Island images from Buster Keaton: The Shorts Collection 1917 – 1923 (C) 2016 Kino-Lorber, Lobster Films. View (7) of the apartments on Mohegan and Waterloo. This entry was posted in Buster Keaton, Manhattan, New York, Roscoe Arbuckle and tagged Biograph Studio, Buster Keaton, Coney Island, His Wedding Night, Oh Doctor!, Roscoe "Fatty" Arbuckle, Roscoe Arbuckle, Silent Comedians, Silent Comedies, Silent Movie Locations, Silent Movies, the Bronx, then and now, Yonkers Raceway. Bookmark the permalink. The greatest thing about old silent movies, is that when you view them you are seeing the past as it actually was – not as you’re told it was. Hunting down locations that may, or may not, still be around, seems an interesting pastime. Thanks John, for this great detective work! It’s endlessly facinating to see how you uncover this history! Thanks Hugh – it’s remarkable how many elements are still here, 100 years later. Enjoyed this very much. wonderful to read and look at. in Oh Doctor I noticed a street sign that was more likely a train sign that read 231STand wondered if it was shot in RIverdale or the east Bronx. again, enjoyed this article very much.